Given the choice, how would you prefer to die? Would you choose to slowly starve to death over a couple of months, your body wasting away in the cold winter as you weaken, ultimately unable to move about, laying in agony till a coyote and Ravens come to help you along by gnawing on your wasting flesh? Would you rather choose an end in a slaughterhouse? I have not been to a slaughter plant, nor do I ever want to go. 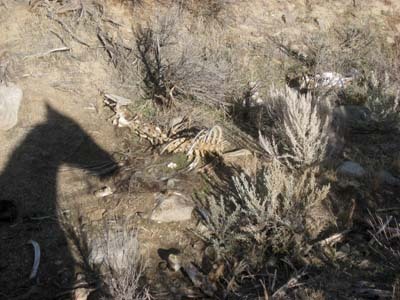 However, I have seen the remains of a mustang who starved to death on the range (above photo). I only saw the end result, not the suffering that got him there. I do not know how long he laid in that spot before the end finally came. It could not have been pretty. And I am currently keeping an eye on a large herd in the area that has nothing - NOTHING - to eat on what was once pasture. All that's left is weeds. Can you say the horses have food if there are weeds left? Well, it might be like you, a human, eating cottonwood leaves that fall from the trees (which, by the way, the horses have done). Sure, someone will try to convince you that you have a plate of food in front of you, but you can't eat it. Maybe there were good intentions and love involved. Maybe not. Whatever the real story, these horses have had nothing substantial to eat for weeks now. 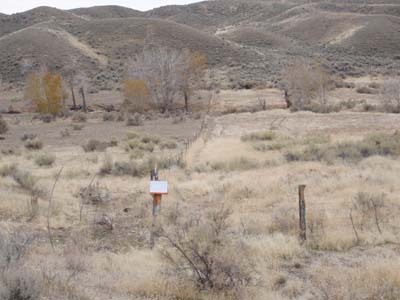 You can see in the photo the fence line between the horses' stripped pasture, and the untouched grass at the neighbor's (and even that is sparse and not particularly nutritious grazing in a winter desert). Sadly, there are too many stories like this around the US. Even people with good intentions have had to get rid of their single horse. They have had to disperse entire herds. They can't afford to keep them. Hay runs roughly around $200 a ton, in this area. Horses should eat minimum of 2 percent of their body weight a day, or 20 pounds a day for a 1000-lb horse. I can tell you that when it's cold, our horses eat more than 20 pounds of hay apiece per day to stay warm. Crude math shows one horse will take 100 days to go through a ton of hay. It will take 50 horses 2 days to go through a ton of hay. The Man should be spending $100 a day on hay to feed this horse herd the minimum amount of hay. He's not. And that's if you can even get hay. Some areas in the south of the country have been unable to get ANY hay due to the drought. What do you do? Sell your herd? You think they'll all go to happy homes? Who's buying horses nowadays? The market is terrible right now, glutted with horses. People aren't even taking in horses that are free. So far, the local horse herd in question is not starving, although I have started to see the ribs on some of them. There are mares with unweaned foals at their sides. There is a stallion to make more foals. But if they do reach the starving state, and some PETA or like organization steps in, it is already too late. If it ends for many of them like it did for the mustang, it will not be pretty. Supposedly, The Man was told to move his horses out, but that hasn't happened. And anyway that doesn't mean they won't suffer the same fate at their new place, which he doesn't have anyway. Hay still costs $200 a ton. Some people are worried he might just turn the horses loose on BLM land to fend for themselves. That will be especially tough for them because it's winter, and grass and water is scarce. Nor is it fair to the ranchers who have the grazing allotment for their cattle. People yell and weep and gnash their teeth against cruelty to animals. They rail against horse slaughter. I get it. I bleed too, hearing the stories and seeing the pictures. But talk only goes so far. It is a start, when it's done in a constructive way, and when real solutions are presented. But what ARE the solutions to replace the 'Happily Ever After' scenario that just will never happen for tens of thousands of horses every year? For those who are opposed to horse slaughter, I ask: What do you personally do about it? Do you donate to horse rescue operations? Do you take in horses yourself? How many? Do you work with groups to get laws passed that will protect horses from death by slaughter or other cruelty? Do you help law enforcement spot illegal practices? And if not slaughter, what do you propose as an option? I have given a former racehorse a home. Just one. I am still wracked with guilt at times when I think of a couple of other special horses I did not track down and try to save. I have been a member of the Exceller Fund for 11 years, giving back something to racehorses who meant so much to me for so many years. It is a pittance, but it is all I can do right now. I would like to take in 100 horses, and I would like to donate millions of dollars to rescue horses from slaughter - but I cannot afford to do so. Think of that. At the least, an estimated couple hundred thousand horses of all breeds, purebred and mutts, added to the population every year. What happens to them all? They don't all get to live out long and happy lives, cared for by some starry-eyed little girl. There are simply not enough people to go around to take care of all the unwanted horses in the country. A quick death at slaughter would be merciful for many of these horses... only that is not a reality either. Many are stuffed, overcrowded, into double decker trailers made for cattle, without food, water or stops to rest, on their way to slaughter. They suffer, get terrified, get sick, get beat up, break bones, bleed out, die, on their way to slaughter. Some states rightly ban the use of double deckers trailers for transporting horses, but it is not federal law, and who enforces it anyway? Understaffed and overworked law enforcement with more pressing problems usually depends on the public to report alledged crimes, so if citizens aren't out monitoring horse transportation, who is? A new uproar has begun at the news that Congress recently lifted a 5-year-old ban on funding horse meat inspections, which would allow slaughterhouses to reopen in the US again. Banning slaughterhouses in the US did not stop horse slaughter. It made the journey of the horses headed to slaughter much more difficult, as they are just transported longer distances in sometimes horrid conditions to Canada or Mexico. 138,000 horses were transported to Canada and Mexico for slaughter in 2010, according to a US Government Accountability Office report. That's about the same number of horses that were killed in the US the year before the last slaughter plant was closed in 2007. The slaughter plants in Mexico are not a pretty sight - look them up on the internet - there is not much humaneness or compassion there. If a ban on horse slaughter in the US was to be continued, what are the options for the tens of thousands of horses that are unwanted every year? Is neglect and starvation a less cruel fate? Does one try to stop backyard breeding? How? Does one try to stop horse industries from breeding so many horses, in trying to create the perfect performance athlete? How? Does one try to get a law passed and enforced saying everybody must provide humane euthanasia for their horse at home? How? Do you want a government employee coming 'round your barn every week to check on your horses' conditions, and make sure the vet is coming out to administer the Sodium Pentobarbital? If slaughter should be allowed in the US, how could it be made better? Pass more compassionate laws transporting horses to slaughter? Make slaughter plants less cruel? I have yet to see Temple Grandin's movie, but, didn't she create a more humane plan for slaughter facilities for cattle? Why isn't this mandatory? How can any of this be enforced? I don't have answers. This is not intended to be an exhaustive look into horse slaughter. I just know I do not want to watch the slow starvation and deaths of 50 helpless horses in my county, and this possible scenario has illuminated the many sticky arguments swirling around the fate of too many unwanted, neglected, and abused horses. Kudos to those horse owners who can properly give their horses a respectful and comfortable end. Many cannot and many do not. So, currently it seems there are two options for at least a hundred thousand unwanted horses every year: slaughter, or death by intentional neglect. It seems there are currently only two options for horse slaughter: Canada or Mexico. It seems that with Congress recently lifting the ban on funding horse meat inspections and the prospects of opening US slaughter plants in the US in as little as a month, an opportunity has opened up to demand more humane horse transportation and slaughter practices and their enforcement here in this country, since we have no control over Canada and Mexico. What do you think of horse slaughter? If you are opposed, what are your solutions? What do you do to help horses who need help? Do you donate to rescue organizations? Have you rescued your own horses? How do you you work to promote horse welfare? Unwanted Horse Coalition, whose mission is to "reduce the number of unwanted horses and to improve their welfare through education and the efforts of organizations committed to the health, safety, and responsible care and disposition of these horses." Equine Protection Network has tips on how to help enforce laws of cruel transport. I wish every town had its own slaughter capacity. Our local butcher used to slaughter horses for people--it was done humanely and quickly and often at home. Where I grew up in Southern Oregon there is a big cats facility--two actually--one is a bit questionable, the other is part of a breeding program for endangered species. A few people have tried to stop them from accepting older or unwanted horses to feed to the cats--misguided sentimentalism. They provide an excellent means for many responsible horse owners to end their equine's lives humanely. We all need to tell our non-horsey friends why we support local, US slaughter!